In this June 25, 2011 pool-file photo, first lady Michelle Obama and daughter Malia listen to their guide during a safari in Madikwe Game Reserve in South Africa. President Barack Obama’s daughter Malia was just 10 and longing for a promised puppy when her family moved into the White House. She’s marked some of life’s milestones in the past seven years, and another one comes Friday: graduation from high school. Philadelphia's fifth annual Budweiser Made in America Festival has become a bit of a presidential affair in 2016. Last night, former president Bill Clinton made an unexpected appearance in the crowd to promote iwillvote.com on behalf of Hillary Clinton's bid for the White House. Clinton was seen hanging out both with festivalgoers and Beyonce Knowles, whose husband Jay Z produces the event through his entertainment company Roc Nation. Somehow, Clinton got one-upped on Sunday by a current resident of the White House: 18-year-old Malia Obama. The president's elder daughter showed up in somewhat ironic style, donning a white ringer tee with the words "Smoking Kills" written on the front. A few months ago, this might have been construed entirely as a health-conscious stand against smoking cigarettes. Last month, however, a leaked undercover video appeared to show Malia smoking a joint (and otherwise being a teenager) at Chicago's Lollapalooza festival. The videos created a firestorm online as familiar critics railed against the Obamas' parenting skills and used the occasion to draw parallels to the state of the nation. That might have happened even without the joint. Former Arkansas governor Mike Huckabee has long maligned the Obamas for even allowing their teenage daughters to listen to Beyonce, despite standing behind the likes of Josh Duggar. This story is nonsensical and the people pushing it forward as some sort of controversial reflection of the Obamas’ parenting skills are lowest-common-denominator C.H.U.D.s. If Malia smoked a joint, who friggin' cares? At the time, an unnamed source in one report claimed that President Obama, a man who has gone on the record about smoking weed as a teen, "went into crisis mode" and was furious at his daughter. The family had already been criticized for allowing Malia to skip the Democratic National Convention in Philadelphia, and now this!? Classic. But, indirectly, Michelle Obama appeared to forgive her daughter in a tweet promoting her global #LetGirlsLearn campaign. On Labor Day, meanwhile, Twitter users chimed in on Malia's pointed choice of garment. 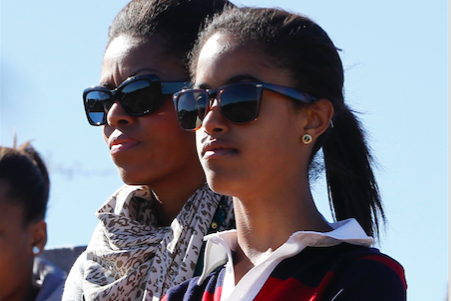 This is some epic level clapback from Malia Obama at the #MadeInAmerica festival. Notably, Malia was also sporting a hat with an "H" for Harvard, where she'll be attending college in 2017 after taking a gap year. That's probably reason enough to get off her back. The rest of Made in America has largely been a success, despite a few hiccups. On Saturday, medics responded to about 1,000 people who rushed the festival's Liberty Stage after hip-hop artist Jay Electronica called out to his fans to join him. Police also requested help from the public on Monday after a 19-year-old Oregon festivalgoer was reported missing by his friends. Live Nation's contract with Philadelphia is set to expire next year, leaving Made In America's future in limbo pending a fresh round of negotiations. Mayor Jim Kenney has suggested he hopes to keep the event in Philadelphia for the foreseeable future.